Growing up in Texas, there are certain expectations. For instance, there are those that assume I have multiple pairs of cowboy boots and speak with quite the drawl. I did recently inherit one well-used pair of boots, and the drawl, well, I guess that depends on who you ask (and what they sound like). It is also expected that I like football. After being at every single football game in high school, I still don’t understand the game. Of course, I was in the band, so it’s not like we paid a lot of attention to those other guys on the field. However, despite this aversion to football, I have a weakness for stories about football. Friday Night Lights is, hands down, one of the best shows on television. If you’re not watching, shame on you! 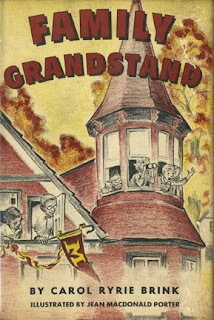 Family Grandstand is also about football, but more about how much fun it is to be a kid and a fan–and have the football star as a friend. My only Carol Ryrie Brink that I’ve read is Caddie Woodlawn, and it’s been years. But several folks recommended this one, so I dutifully requested it from the library, not knowing too much about it. It is a book that is thick with fall and football and you can almost feel the growing chill in the air. It also has a fabulous house, complete with tower and an absent-minded history professor father. Score! It’s a family story, complete with some really fun kids. I adore Dumpling and think she and Oliver Melendy would get on like gangbusters. Though Oliver Melendy may occasionally feel the need to talk bugs with Dumpling’s older brother George. And of course, there is Tommy Tucker, the football hero that is not doing so well at chemistry but mows grass beautifully. The family does a bit of match-making, fnding a tutor for Tommy, and consequently saving the big game. There are some great “day in the life” details–Susan and Dumpling heading downtown to shop. Parking cars–and the magic of an old car to play in. Freeing the turtles (and then the bird). Torrible Terrence. Decorating for Halloween. And have I mentioned the fabulous old house? Sigh. Though there is little description about the games, I still count this as a sports story because it is about loving the game. And though I don’t love the game, I do love the stories.